Here you have the fourth and last volume from a company from New York which sold CDs with stuff downloaded from internet. How original! Here's a complete list of the contents of the disc: 15 Editors for maps, WADs and textures; 11 Frontends including WadMan; 18 Other utilities; 13 FAQs covering every aspect of the games; Three graphic packs (the Imp into Snowman is fun); Three sound packs (including The Three Stooges); 20 "movies", recorded games which might feature more than one recording, and seen together form a little movie; 161 WADs for Doom; 1,091 WADs for Doom II. Note that each WAD can contain more than one level. 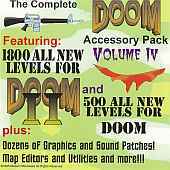 That might explain why other descriptions of this disc say 500 new levels for Doom and 1800 levels for Doom II.